What is the Public Involvement Fund? 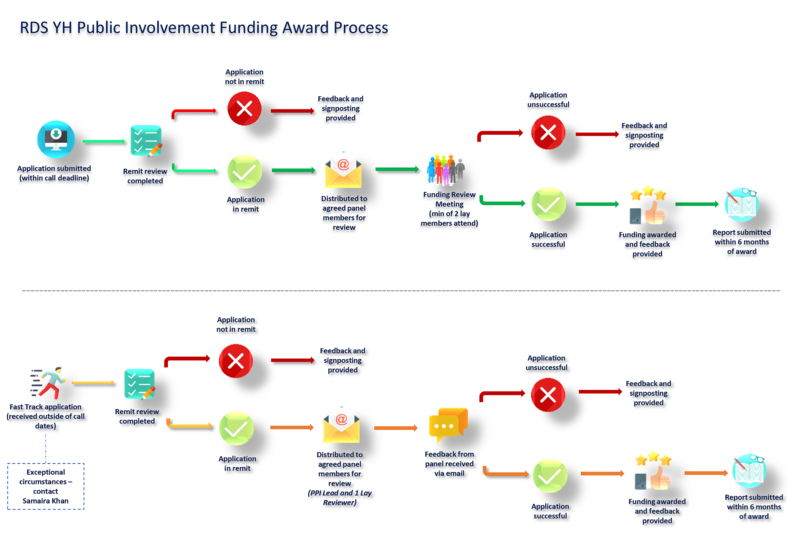 The public involvement fund can be applied for by researchers from the Yorkshire and Humber region to enable them to involve members of the public in developing research ideas and their grant application. There are four calls a year for awards of up to £500. Find out about our current call. How can these funds be used? cover the costs of setting up one or more meetings with a group of patients, carers, service users or the public (for example meeting room hire, refreshments). reimburse the people involved for their time and travel expenses. establish a new public involvement panel. Researchers who receive funding are asked to complete a brief evaluation. How to apply for the fund? Read our guidance notes and complete the application form providing as much information as possible. All applications are reviewed by RDS YH staff and by members of the RDS YH Public Involvement Forum. At least one lay member of the forum will review each application. The Public Involvement Fund runs 3 calls each year, see dates here. In exceptional circumstances, which are outside of the applicants control, we may accept applications between calls. For example, when a commissioned call has a tight deadline. These fast tracked applications will be reviewed by the RDSYH Public Involvement Lead and a minimum of one member of our Public Involvement Forum. If you would like to be considered for a fast tracked application please contact Samaira Khan (samaira.khan@sheffield.ac.uk), Public Involvement Lead Sheffield, to discuss further.